Pyramiding, or combining, genes on the same chromosome is a special case of gene pyramiding. This case study describes the use of molecular markers to pyramid two disease resistance genes on tomato chromosome 5: Rx-3 (resistance to tomato bacterial spot) and Pto (resistance to bacterial speck). Pyramiding genes on the same chromosome is a special case of gene pyramiding. This case study describes the use of molecular markers to pyramid two disease resistance genes on tomato chromosome 5: Rx-3 (resistance to tomato bacterial spot) and Pto (resistance to bacterial speck). Bacterial spot and bacterial speck, two diseases with worldwide economic importance, can impact tomato crops simultaneously. Figure 1 shows a field affected by bacterial spot. Yang and Francis (2005) sought to combine resistance genes for both diseases. Although Yang and Francis (2005) knew from previous studies (Yang et al., 2005; Martin et al., 1993) that both resistance genes were on chromosome 5, they didn't know the genetic distance between the two genes. To combine Rx-3 and Pto, Yang and Francis (2005) crossed two inbred parents (see video): one homozygous for Rx-3 but susceptible to bacterial speck and the other homozygous for Pto but susceptible to bacterial spot. The video below outlines the general procedure for making crosses. The F1 progeny were self-pollinated to obtain F2 seed. Figure 1. 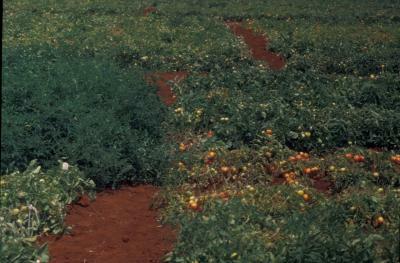 Tomato plot that includes tomato plants that are resistant (left) and susceptible (mid-right) to bacterial spot. Photo courtesy of David Francis, The Ohio State University. In the F2 generation, Yang and Francis (2005) wanted to identify individuals resistant to bacterial spot and bacterial speck, and to calculate the genetic distance between Rx-3 and Pto. To achieve these objectives, Yang and Francis (2005) genotyped a population of 419 individuals with two molecular markers (one associated with Pto and one associated with Rx-3) to identify individuals with alleles that confer resistance to both diseases. In the case of Pto, the molecular marker was within the Pto gene, so Francis and Yang did not have to worry about recombination between the marker and gene. However, in the case of Rx-3, the molecular marker used to select for bacterial spot resistance was not within Rx-3, so recombination between the marker and Rx-3 was possible. This meant that selection based on the marker alone wouldn't be perfect. In some cases, individuals with the resistant allele would be susceptible. Yang and Francis conducted phenotypic screenings to confirm that individuals expected to be resistant based on their genotype were, in fact, resistant. Individuals with resistance to both bacterial spot and bacterial speck could only be obtained if a recombination event occurred between Pto and Rx-3, because each parent carried only one of the resistance genes. The chance of a recombination event depends on the genetic distance between Pto and Rx-3. Of the 419 F2 individuals genotyped, Yang and Francis identified 13 plants that were homozygous for bacterial spot and bacterial speck resistance alleles and 94 individuals that were heterozygous. Yang and Francis estimated that Pto and the Rx-3 marker were 36.8 ± 2.2 cM apart. See the animation about genetic mapping to learn more about the principles of genetic mapping. The loose linkage between Pto and the Rx-3 marker means that breeders must take care to ensure that they maintain resistance conferred by Pto and Rx-3 when making crosses with individuals that have both these resistance genes. Martin, G. B., M. C. de Vicente, and S. D. Tanksley. 1993. High-resolution linkage analysis and physical characterization of the PTO bacterial-resistance locus in tomato. Molecular Plant-Microbe Interactions 6: 26–34. (Available online at: http://www.apsnet.org/publications/mpmi/BackIssues/Documents/1993Abstracts/Microbe06-026.htm) (verified 30 Aug 2012). Yang, W., and D. M. Francis. 2005. Marker-assisted selection for combining resistance to bacterial spot and bacterial speck in tomato. Journal of the American Society for Horticultural Science 130: 716–721. (Available online at: http://journal.ashspublications.org/cgi/content/abstract/130/5/716) (verified 30 Aug 2012). Yang, W. C., E. J. Sacks, M.L.L. Ivey, S. A. Miller, and D. M. Francis. 2005. Resistance in Lycopersicum esculentum intraspecific crosses to race T1 strains of Xanthomonas campestris pv. vesicatoria causing bacterial spot of tomato. Phytopathology 95: 519–527. (Available online at: dx.doi.org/10.1094/PHYTO-95-0519) (verified 30 Aug 2012). Shermin, J., and D. Quinn. Genetic mapping [online lesson] Wheat CAP: Wheat Coordinated Agricultural Project. Available at: http://maswheat.ucdavis.edu/Education/animations/anim_mapping.htm (verified 30 Aug 2012).